Note: the 11-34t and 11-28t freewheels have been discontinued by Shimano. A large part of the success of the Shimano company is based on the cassette freehub, which has become nearly universal on decent quality bicyles. Up through the mid 1980s, most bikes used traditional thread-on freewheels and matching hubs. They give much better support to the axle, causing bent/broken axles to be almost non-existent on modern bikes. They are much easier to work on, because there are no parts that get screwed tight by the rider's pedaling effort. They provide greater flexibility in gearing choice, and are easier to create custom gear sets with, since all of the sprockets use the same spline pattern. 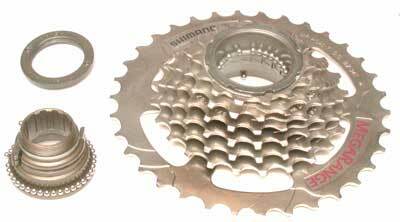 Replacement cassettes are generally cheaper than complete freewheels of similar quality. When Shimano started moving to 7-speed systems, in the mid 1980s, they used their marketing clout to push things along. They did this by making 7-speed an option only supported with their Freehubs, and not making 7-speed freewheels (except for a couple of expensive, high-end road models, Dura-Ace and Santé.) Thus, if you wanted 7-speed Shimano SIS shifting (and everybody did!) you had to buy into the cassette Freehub system. Almost overnight, Freehubs became the norm for good-quality bikes, and thread-on freewheels were relegated to only the cheapest low-end bikes. Shimano continued to make thread-on freewheels for the lower end market, in 5- and 6-speed versions. After a few years, once the cassette Freehub was well established for higher end bikes, they even started making 7-speed freewheels. The earliest freewheels had the sprockets attached to the freewheel body by threads. As the rider pedaled, the sprockets would gradually get screwed on tighter and tighter, until they were nearly impossible to remove. In the 1970s, inexpensive Japanese freewheels from Sun Tour and Shimano took over the market, mainly because they used a superior system. The sprockets and freewheels had splines (grooves) that mated, so the sprockets could just slip onto the freewheel body, and the splines would keep them from sliping. Up through the 1980s, freewheels and cassette Freehubs used a mix of threaded and splined sprockets, with, typically splined sprockets on the big end, and threaded ones on the small ends. Early "Uniglide" cassette Freehubs used just one threaded sprocket, the smallest, which also acted as a lockring to hold the stack of splined sprockets onto the Freehub body. Starting in the early 1990s, Shimano cassettes and freewheels used the new Hyperglide design. Hyperglide made a huge improvement in shifting quality, but required that each sprocket be aligned precisely with its neighbors. This was not practicable with screw-on sprockets, so the new series of Hyperglide Freehubs and freewheels used all splined sprockets. This presented a problem in freewheel design, however. The use of all splined sprockets meant that a separate lockring was required to hold the stack together. Due to the constraints of needing to provid access for a freewheel remover, and access to the bearing cone, it was impossible to make a Hyperglide freewheel with anything smaller than a 13 tooth sprocket. This wouldn't have been a problem back in the days of 27 inch wheels and 52 tooth chainrings, but for mountain bikes with smaller wheels and smaller chainrings it resulted in a top gear that many people found unsatisfactory. Of course, this wasn't a problem with the cassette Freehub, so most of the industry expected Shimano to ignore the problem...after all, anybody who wanted a higher gear could select a bike with a cassette Freehub and get an 11 tooth sprocket. 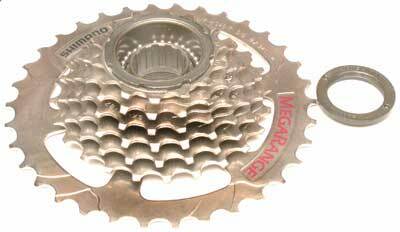 It was quite startling (to those of us who follow such things) when, in 2001, Shimano introduced the Mega 7 freewheel, a very nicely chosen* 11-13-15-18-21-24-34 setup! This is a Shimano Hyperglide of conventional construction, a 14-34. The left-threaded cone/lockring has been removed and you can see the smaller, outer row of bearing balls. The same freewheel, disassembled. The sprockets and their holder have been lifted off revealing the core and both sets of bearing balls. This gives access to both the pawls and to the bearing balls, but reassembly is very difficult, because the bearing balls on the lower end need to be kept in place while the core is reinserted into the sprocket carrier. New Mega 7 11-34 freewheel partially disassembled. The core has large diameter threads that screw into the back of the sprocket carrier. This also acts as a lock ring to hold the 34 tooth sprocket to the carrier. The other sprockets are held by a small diameter lockring on the other end, just outboard of the 11 tooth sprocket. A close-up of the Mega 7 core unit. No loose parts fall out at this stage of disassembly. The pawls can be serviced without disturbing the bearings in any way. This whole assembly can be flush cleaned if necessary with no further disassembly. The bearing races are larger in diameter, with more balls than conventional sysems, causing these freewheels to be unusually free running, as well as reducing play in the bearings. The upper section of this in the photo is the part that screws on to the hub. The lower section, with the large diameter threads and the scalloped flange screws into the sprocket carrier. 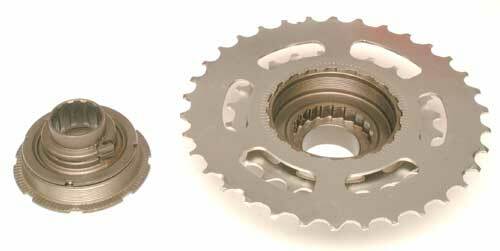 When it is out of the sprocket carrier, as shown, these two parts spin freely relative to one another in both directions. The Mega 7 core disassembled. The bearings are assembled the same as any conventional freewheel. 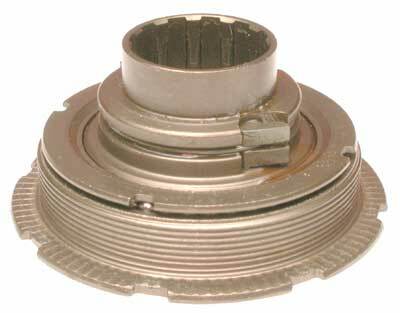 The shim washers (bottom center) are used to adjust the bearing cone. * At first glance, many people look at the sprocket numbers 11-13-15-18-21-24-34 and wonder what Shimano's engineers were smoking when they came up with that setup, with a 10 tooth jump between the bottom two sprockets! In practice, this is actually a very nice arrangement, because the big jump to the 34 allows the jumps in the cruising range to be much more reasonable. If the jumps were evenly spaced, the user would often find that one gear was too low for cruising, while the next one up was too high. This type of freewheel, sometimes known as an "alpine" design, is intended to provide comfortable cruising, with the super-low gear for the tough hills. It works a lot better on the road than it looks on paper!